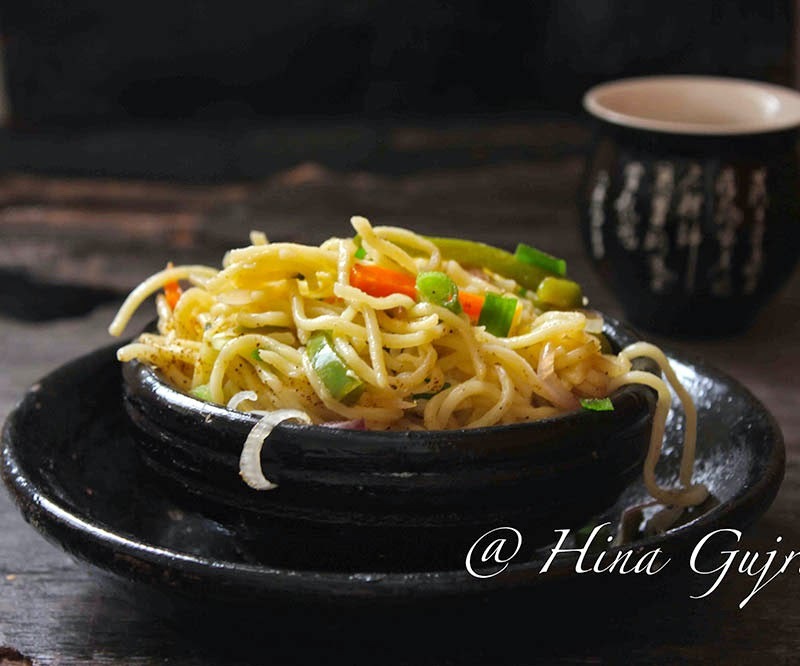 Chilli Garlic Noodles is a simple stir-fried noodles recipe infused with bold flavours of garlic and hot red chilli. If you are not in a mood of something elaborate yet bold than this could be the satiating dish for you, serve with Manchurian or a schezuan sauce. These Chili Garlic Noodles taste delicious on its own as well. 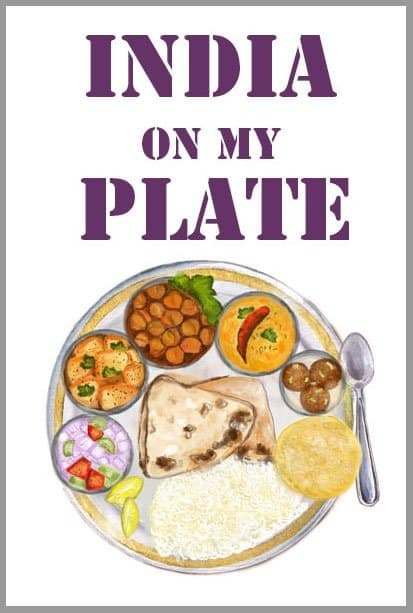 Indian Chinese has become an integral part of our food culture and we often moderate those foreign dishes with our kitchen spices. Whether it is Manchurian with vegetarian dumplings or Fried Rice, they all have Indian influence to them. 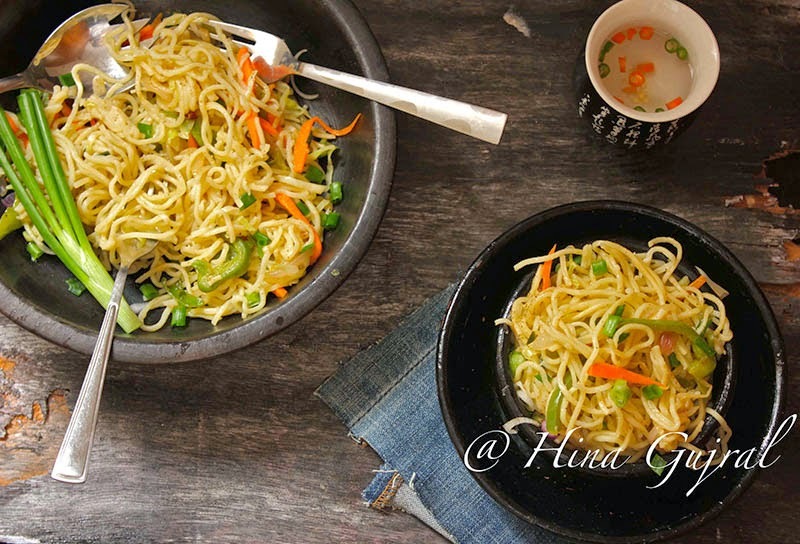 Like in my house we love garlic, so I always infuse tons of garlic in noodles whereas some like to season noodles with green chillies, sometimes I almost forget what authentic Stir Fried Noodles taste like because I am so used to of this Indian version. 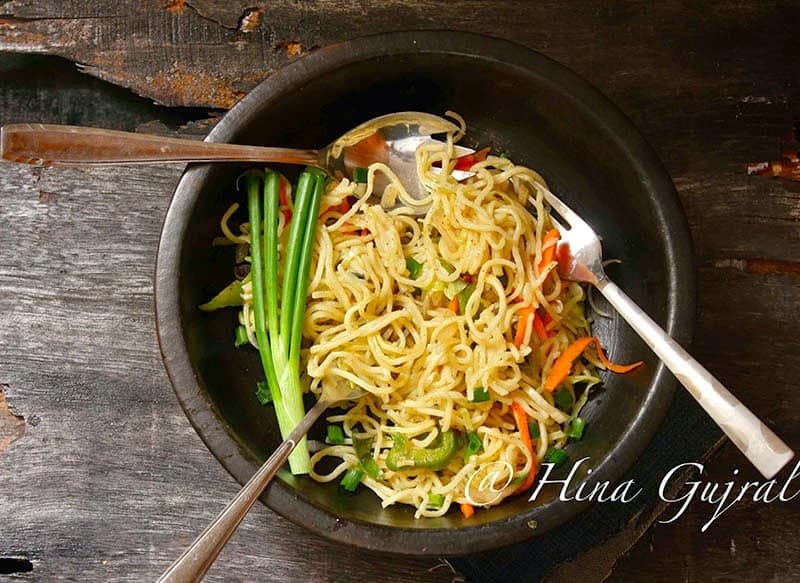 Noodles are our favourite Friday night dinner along with stir-fried meat dish, when “he” comes back from work we sit down with our bowls of noodles and watch our favourite movie or television series, plan for the weekend and go to bed late night. Recently I switched to whole-wheat noodles from regular white flour noodles, which are a healthy choice and now available at reasonable prices in all the supermarkets. Chilli garlic noodles is a simple Chinese stir-fried noodles recipe infused with bold flavours of garlic and hot red chilli. 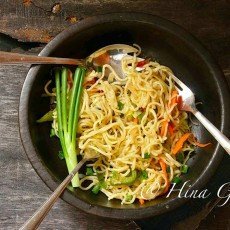 Learn how to make delicious chilli and garlic noodles in few simple steps. Oil for cooking + 2 tsp. In blender make smooth paste of garlic and red chili using little water. Smear the paste over boiled noodles along with 2 tsp cooking oil. Heat oil in a wok, add sliced onion and stir fry until translucent. Add sliced peppers and capsicum, stir fry for 2 – 3 minutes. Now add the noodles along with soya sauce and seasoning. Mix nicely. Turn off the heat and garnish with spring onion greens. Serve Chili Garlic Noodles warm.